Keg spear have a two parts: a tube fitting and the connecting head, which are interconnected like a fork with a socket. In common parlance the coupling head is also called “ker connector” and “keg head”. Connection head is used to connect the gas (CO2) and the beer lines. The tube fitting is immersed in the beer which it is pushed through the gas under pressure (of approx. 2.4 bar) and is fed via the coupling head on the beer cooler. 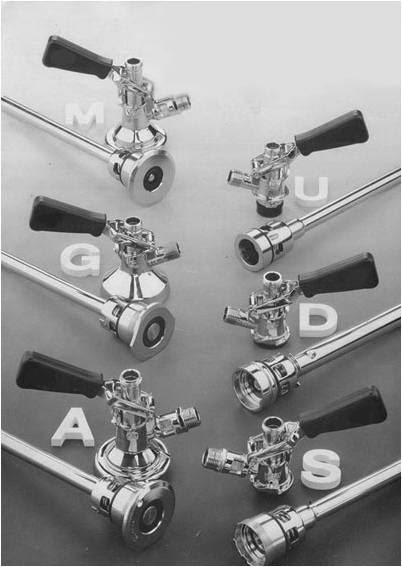 It is important to know that the keg fittings are of different types, which are incompatible with each other – manufacturers of keg beer prevented from dispensing beer competitors. A-type system also known as “Flach”. This is most popular fitting system. Used by all Europe. D-type system also known as “Korb D”. Used in Europe. G-type system also known as “Flach T”. Used in Europe. M-type system also known as “Kombi”. Used in Europe, Ukraine and Russia. S-type system also known as “Korb”. Used in Europe and UK. U-type system also known as “Korb U”. Used in United Kingdom. Market standard is 2″ x 14 TPI. Less popular two other systems: RD 52 x 6 TPI and RD 52,8 x 6 TPI (also called “big thread”). Very rare system 2 1/8″ x 7 TPI. Also, keg fittings may have a lock-type system without thread (with tamper evident ring) aka Special Neck.